If your DBF files have been damaged or corrupted, standard DBF readers won't work. You will get an error message or see gibberish instead of your valuable data. However, you maybe in luck! DBF Recovery from HiBase Group can restore your data. 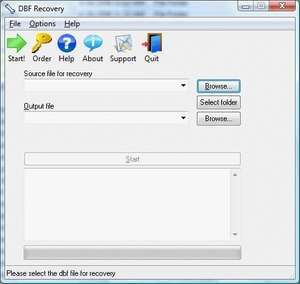 DBF Recovery 4.1 is a shareware program and can be used as a demo to try the software until the free trial period has ended. A full version of the program is available after the trial period ends. For security reasons, you should also check out the DBF Recovery download at LO4D.com which includes virus and malware tests. Additional screenshots of this application download may be available, too. Quickly and effectively format you hard drive with some of the best wiping tools available for Windows. Whether it be Fat32 or NTFS drives, free formatting utilities will quickly erase your hard drive. Check out some of the freeware downloads available in the formatter category. They contain no strings and are available at zero cost.